WKE40 Cobalt High Speed Steel (HSS) is world renown for superior quality. WKE45 HSS with a 11.0% cobalt content, was developed to meet maximum requirements for wear resistance, toughness, and hot hardness with excellent grindability. Cobalt HSS applications include turning or milling stainless steel and high alloy nickel-chrome steel or tool steel. Cobalt tools will outlast M2 tools. Choose from two available grades in One-End Split only. Please note: COB2230B will be discontinued when current stock is depleted. Size 1/8"dia. x 2"long 3/16"dia. x 2"long 1/4"dia. x 2"long 1/4"dia. x 3"long 5/16"dia. x 2"long 5/16"dia. x 2-3/8"long 5/16"dia. x 3"long 3/8"dia. x 3"long 1/2"dia. x 2-1/2"long 1/2"dia. 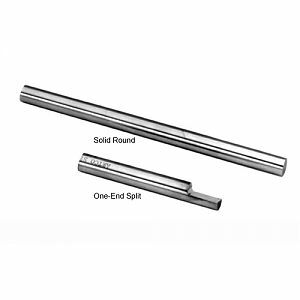 x 3"long - Both end split (B) 6mm dia. x 3"